What and How does tongue weight work? 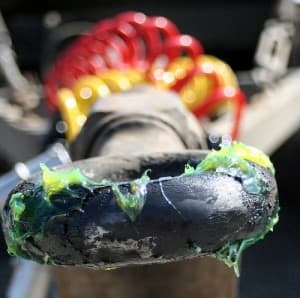 Tongue weight is the quantified force onto the hitch of your truck. Although the weight usually varies from only 6 percent of your Gross trailer weight, this variance can make a big difference. You’ll want the amount of tongue to be just perfect before you tow your trailer. Why will it keep you safer as driver? Towing with too much tongue weight will affect your ability to steer because the imbalance will throw the vehicle off. Too light is bound to result in a problem that is often a cause of accidents on our roads. This problem is called trailer’s way and what is happening just what it sounds like, the trailer has its way. Now you could see why this causes so many road accidents. So save yourself and other drivers a problem and adjust your trailer weight correctly. Wondering how will you know how if the weight is correct? To weigh with Weigh Safe, it isn’t difficult at all you’ll just simply put the trailer on. First, put the trailer onto a jack and lift the trailer up. Next, carefully place the scale under the trailer. Be sure to know the jack is in the right place, this is the most dangerous part of the whole weighing process. Then you’ll lower the trailer until the weight is completely on the scale. All that’s left to do after this lift the jack up, carefully again, and the weighing process is over. Now that you know the basics to tongue weighing you’ll be able to weigh the tongue of your trailer. The Weigh safe is among the best of these scales and you’ll find it is just that easy to use. What’s left? Hitch up the trailer and adjust it to the correct amount of weight. Oh and one last thing, hit the road with the wind in your hair and adventure in your future having used the weigh safe towing your truck.